Tuesday, in his first State of the State address, the newly elected Democratic governor of California expressed a determination to address those challenges. Lip service or actual resolve? Check back later. 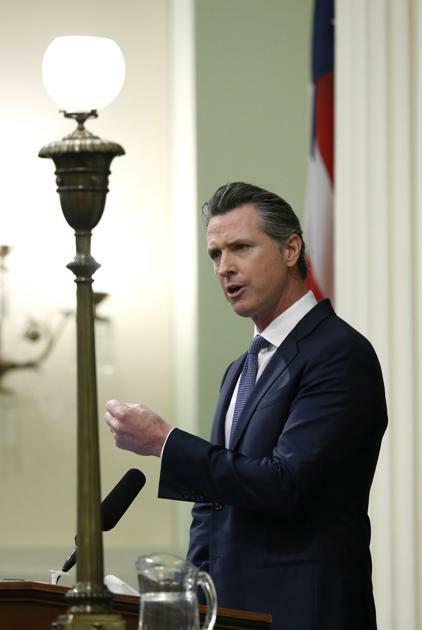 Newsom, citing ballooning cost overruns, told a joint session of the California legislature he was significantly downsizing the state’s commitment to High Speed Rail — with an asterisk. That asterisk is California’s Central Valley: Newsom said he will continue to support construction of the Bakersfield-to-Merced phase that’s underway now. That link, he said, can play a major role in the San Joaquin Valley’s economic emergence. That’s right: Newsom sees a bullet train running from Bakersfield to Merced and no farther. For the time being. Well, that’s certainly true. If ever a California governor has spoken truer words about that longstanding neglect, the moment eludes me now. The bullet train, Newsom said, is one of the vehicles capable of getting us there. “High-Speed Rail is much more than a train project,” Newsom said. “It’s about economic transformation and unlocking the enormous potential of the Valley. We’ll want to hear more about these opportunity zones, but Newsom’s words sound like a starting point for discussion about Kern County’s reliance on the two industries under assault in the Central Valley: agriculture and, especially, oil and gas. Economic diversification will be essential, given the obstacles those industries have been facing, for good or ill. Precisely what that story might be, he didn’t say, and I’m not prepared to fill in the blanks. Nothing happens without a more educated workforce and that’s not an overnight fix. Undaunted, Newsom has named his economic development director, Lenny Mendonca, the new chairman of the High-Speed Rail Authority, which will finish its Phase 1 environmental work. “We’ll connect the revitalized Central Valley to other parts of the state, and continue to push for more federal funding and private dollars,” he said. Newsom said the costs of simply walking away from the project are too high. At the top of that list of mistakes is the succession of cost overruns that have eroded political and popular support for the project. To the end, Newsom has offered a new set of transparency measures he hopes will keep costs down and expectations high. What I find interesting is that this most liberal of governors got more positive feedback from local Republican legislators and than from local Democrats. His neighbor, Democrat TJ Cox of the the 21st Congressional District, took a dimmer view. Assemblyman Rudy Salas, D-Bakersfield, did not address Newsom’s comments on high speed rail at all, choosing instead to praise his mention of “clean water, workforce training, housing and ensuring the Valley receives its fair share of resources” and “accountability, transparency and efficiency” in government. Newsom hasn’t stopped the bleeding, but the tourniquet is in place. He can ease the pain if his “opportunity zones” are meaningful tools. We’re eager to hear more.